Information about the Beaches in Cyclades islands, in Greece but also information about beaches in many islands of the group: The most popular Greek islands belong to the island group of Cyclades. Located in close distance to Athens and with characteristic architecture style, these islands also stand out for their gorgeous sandy beaches. There, you can find Cycladic beaches of all styles: pebbled or sandy, organized or remote, large coasts or small coves. The most famous Cyclades beaches are located in Mykonos, Paros, and Naxos. In fact, these three islands are also great for water sports, particularly for windsurfing and kite surfing. Golden Beach in Paros, Mikri Vigla in Naxos and the southern beaches of Mykonos are very popular with these wind sports. The rest of the Cyclades islands are not that popular, therefore those Cyclades beaches are less busy. Milos, Sifnos, Amorgos, Andros, and Tinos have equally beautiful beaches but with fewer tourism facilities. In any case, all Cyclades beaches have its own special charm. Either organized like the beaches of Mykonos and Paros or secluded like the fantastic beaches in Amorgos and Folegandros, they provide a fantastic location for relaxing and enjoying the Greek sun. Discover the best beaches in the Cyclades: Super Paradise in Mykonos, Plaka in Naxos, Kolymbithres in Paros, Tsigrado in Milos, and more. Super Paradise beach on Mykonos island is among the most beautiful beaches in the Cyclades and generally in Greece. This is a large bay on the southeastern side of Mykonos. One side is organized with sunbeds, umbrellas, beach bars, taverns, and watersports, and this is the most popular part of the beach. There is also a more secluded side with fewer tourists. The soft golden sand and the crystal water makes Super Paradise among the most fantastic beaches in Cyclades islands. Plaka beach in Naxos island is among the largest beaches in the Cyclades. With soft white sand and exotic waters, it attracts many visitors but it never gets packed due to its large size. Some parts of Plaka beach are organized with sunbeds, umbrellas, taverns, and watersports, but the largest part of the beach is not organized and ideal for total relaxation and privacy. Located on the southern side of Milos island, Tsigrado beach is difficult to reach but totally worth the effort. The soft white sand and the amazing water of Tsigrado make a fantastic place to swim. This beach is totally unorganized and visitors should take their own supplies with them. In order to reach this stunning place, people have to get down to the beach through a short cliff. Located in close distance to the port and main capital of Ios, Mylopotas is the most popular beach on the island. Due to the many watersports centers and the beach bars that line up the sandy coast, Mylopotas is a great place for young visitors. Many beach parties are organized during summer nights, creating a cheerful atmosphere. The soft golden sand and the crystal waters of Mylopotas attract many tourists. Elia is among the largest beaches of Mykonos island. Located on the southeastern side of Mykonos, this is the last stop of the boats that depart from Mykonos Town and go to the southern beaches of the island. Elia is organized with many umbrellas, sunbeds, restaurants, and bars but it is quieter than other Mykonos beaches. It distinguishes for the fantastic water and the soft sand. Kolymbithres beach in Paros island is located right opposite the bay of Naoussa, on the northern side of the island. This is not actually a large beach but small coves with soft sand and crystal waters. The most impressive thing about Kolymbithres are the white rocks that separate the coves and which are frequently used for sunbathing. This place can be reached by bus or boat from the port of Naoussa. Red beach is the most famous beach in Santorini island. Although the seabed can be pretty inconvenient due to the pebbles, it offers an impressive landscape with red cliffs and evident volcanic background. The Red Beach gets very popular, especially in high season. Part of the beach is organized with sun beds and umbrellas. Next to the Red beach is the White beach, with white cliffs and nudism-friendly. Agia Anna beach is among the most beautiful spots of Amorgos island. It became famous since scenes from the movie The Big Blue were shot there. This is a small pebbled bay with fantastic waters and can be reached by climbing down a hiking path from the Monastery of Hozoviotissa, the most important landmark of Amorgos. The beach of Agia Anna and other pebbled bays around are secluded, nudism-friendly beaches in Amorgos. Agios Prokopios in Naxos is among the most organized beaches on the island. It is found in close distance to the main town and the port and gets very popular with visitors. A part of Agios Prokopios is lined up with umbrellas, sun beds, beach bars, taverns, and watersports centers, while other parts are not organized at all. Many hotels and apartments are also found in walking distance from the beach. Although Kythnos is among the least developed islands of the Cyclades, it is home to a fantastic beach, Kolona. Located in a secluded spot on the northwestern side of the island, Kolona is actually a peninsula with two sandy shores that connects Kythnos with the tiny islet of Saint Minas. Right before Kolona is another great beach, called Fykiada. Are you looking for a hotel near one of the most beautiful beaches of Cyclades? 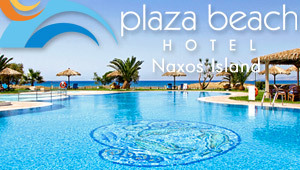 Check our proposed Cyclades hotels.